I RECENTLY ran an interview with author Kate Mosse, the writer behind the best selling Labyrinth, on This French Life about her latest book Sepulchre. While I was doing some reading up before chatting to Kate I spent some time on her website and crossed a collection of tips she has drawn together from her creative writing classes at West Dean College in Sussex. I thought some people might want to take a browse. MANCHESTER journalist Judi Goodwin offers up her Seven Deadly Sins of PR as part of a course she is running a little later this year. Judi started her career in public relations and calculates that in her 30 years as a freelance journalist, she has received more than 20,000 press releases. IT is cold and wet outside, so I thought I'd put together a few thoughts and pointers on my "media consumption" after getting a polite nudge from Linda. Looking at things from a distance and you could say I am welded to the computer, spending most of my work time reading websites, researching articles and pursuing ideas with others. Over time I have used a variety of software packages and web based services, as well as read countless books and documents on improving your work flow. But it seemed that I would still get very little done and drift off down internet alleyways losing track of time. I DON'T normally promote things on this site but if you are keen to improve your writing skills then you may want to check out a couple of courses being offered by Judi Goodwin. Judi is set to stage two courses this summer and I know a number of people who have taken part in classes in the past, for example Andrea Wren. On offer is a two day course at Manchester University titled "Don’t get it Right – Get it Written" which aims to develop your skills and confidence to get that first draft down onto paper. ON the Freelance Writing Tips website I have been putting together with Linda Jones there is a great piece about living the life of the freelancer by writer Andrew Crofts. 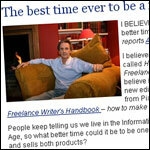 Titled The best time ever to be a freelance writer, Andrew explains that with modern technology and the demand for writers at such high levels with a little planning you can make a success of whatever form of writing you want to do. To highlight the demand for words he quotes publisher Random House who say they sold four times as many books in 2005 as the entire worldwide book industry did in 1955. 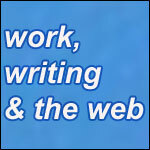 Andrew has rewritten his guide to earning a living from writing The Freelance Writer’s Handbook to take in the world of online publishing and the opportunities that offers. IF you are struggling for ideas on what to write for your blog then instead of pulling your hair out take a look on your computer for inspiration. I have just been pinging emails to Linda Jones whose website You've Got Your Hands Full is going from strength to strength as her readers get involved via comments and linking to the site. Linda has just mentioned that hidden away on her computer are three files full of articles she has written in the past that are suitable for her site. ONE of the things that can produce a poor website are pages that are difficult to read. If you have taken much time and effort to put together a well written piece, only to place it on your site in a page layout that gives readers a headache, then you are likely to have a struggling website. 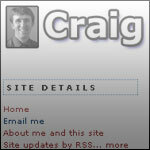 - Make it very easy for people to read your words; simple fonts such as Verdana or Ariel, preferably in black on a white background is a good place to start. - But also give your words some room to breath with plenty of white space around them, break up paragraphs with clear carriage returns so people don't suffer from word tiredness. - And don't go overboard with bold and italics, simple bullet points may be more suitable if you are keen to highlight a point. - Study the websites you read the most as there is a good chance they have got the basics right, otherwise you wouldn't be visiting them regularly.